This pilot project was never just about the zipline, it was about getting the community involved and showcasing the beauty and creativity that is, Venice Beach. Thank you LA for the opportunity. 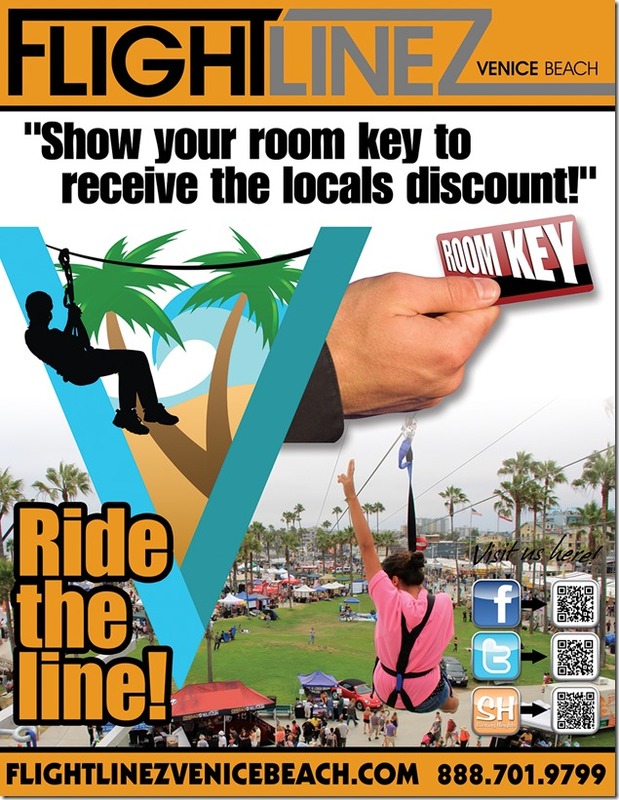 Flightlinez/Greenheart is pleased to be in a partnership with the City of Los Angeles Department of Recreation and Parks to operate a zipline attraction on Venice Beach. 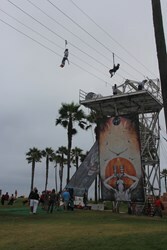 The Department of Recreation and Parks along with former Council member Bill Rosendahl proposed a pilot zipline attraction and program to the Venice Neighborhood Council in May 2011, which was then approved by the Los Angeles Board of Public Works, and finally the California Coastal Commission. Canadian-based Greenheart Conservation Company installed the attraction and operated the pilot 90 day program. The forty-second long ride was expected to attract 500 to 1,000 people each day. Flightlinez Venice Beach was established as a temporary attraction to raise money to assist in cleaning up the Venice Beach area. A portion of the ride proceeds will go back to the City to assist in these efforts. Flightlinez has set up a children's program allowing kids to experience different forms of art, dance, performance, and natural leader skills they can use throughout life. 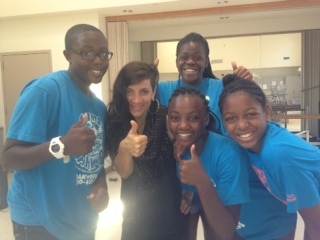 The children's program, Soaring Heights, a mentorship program focused on Dance, Aerial and Theater. Students showed their work for the community, creating a gracious opportunity for the students to not only share their efforts but for the community to unite. Local artists submitted applications in order to have their work displayed off the take off tower and on the frames built around the k-rail. Once the towers were complete several artists either finished their pieces on site or completely created their pieces on site. Three 30 foot banners hang from the take off tower. Hans Walor, Joseph Skala and Chris Saunders are responsible for these masterpieces. Each has its own style and expressing the eclectic energy that makes Venice Beach what it is: unique. The zipline ran over Windward Park allowing guests to fly parallel to the boardwalk and the coast. Look into the skate park, watch the street performers from a birds eye view or race the kids below. 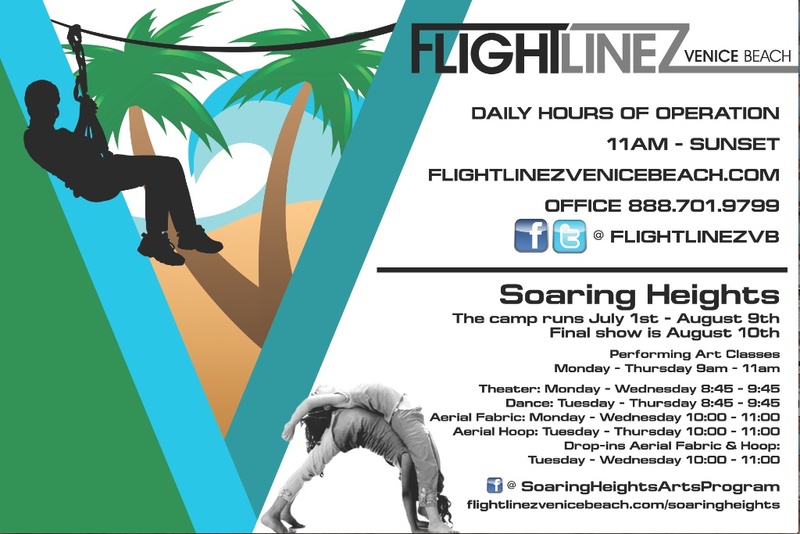 Flightlinez Venice Beach location stopped operations on Sept 16, 2013. Scheduled to be off the beach by Oct 1, deconstruction has started. The positive feedback from tourists and locals alike showed a genuine interest for the attraction in Venice Beach. From the performance and children's classes to the artwork being displayed both the boardwalk and local LA community and really embraced the concept. Several local businesses partnered up with Flightlinez giving customers chances to receive discounts at either locations depending on who they visited first. Establishments like Bank of Venice, Jay's Bike Rental, Larry's, Danny's Cairo Cowboy and Forever Venice offered anywhere from 10 - 20% off if you showed your Flightlinez wristband. Several youth groups and businesses looking for a quick team building activity took field trips down to the zipline. Hell's Kitchen was down to film an episode. Music videos were created with Bear Trap entertainment, street performers like the Calypso Tumblers enjoyed the experience. Cyclist and skate boarders enjoyed the free valet service. Families were able to enjoy memorable moments as they overcame fears or simply enjoyed spending time doing something unique together. Flightlinez would like to thank the City of Los Angeles, Venice Beach Recreation and Parks, Venice Neighborhood Council, Oakwood Rec Center, Soaring Heights, All the artists who participated, the boardwalk vendors, local businesses, locals and tourist, everyone who assisted in creating an amazing experience on Venice Beach this summer. Flightlinez is committed to serving the community. Both locations in the Las Vegas area, Flightlinez Las Vegas and Flightlinez Bootleg Canyon hold charity events to support local and national causes in an effort to both increase awareness and give the community a way to really enjoy giving back.